Going to Disney or Universal this summer?? Want to and save some money while doing it? As part of Black Friday-Cyber Monday Saving Celebration- 4 day sale: Save 50% with Black Friday Deals! Book now in Las Vegas, Orlando, Chicago and More! Book by 11/26, Travel by 12/31 , you can get optimal savings by booking a mini getaway now! From multiple location in Florida, California, and even places like Nashville, Tenn. Offer states you must travel before end of year, BUT as you can see in the screen shot below, I booked mine for this summer!! You may need to double check the location and see if the offer is still carried over like mine was. You can save up to 50% off your hotel stay now and have your spring break getaway, family summer vacation or even go away for weekend , just you and your loved one! I love planning trips in advance because I can use the money I’m saving towards restaurant, spas, and various other attractions we might be interested participating in. 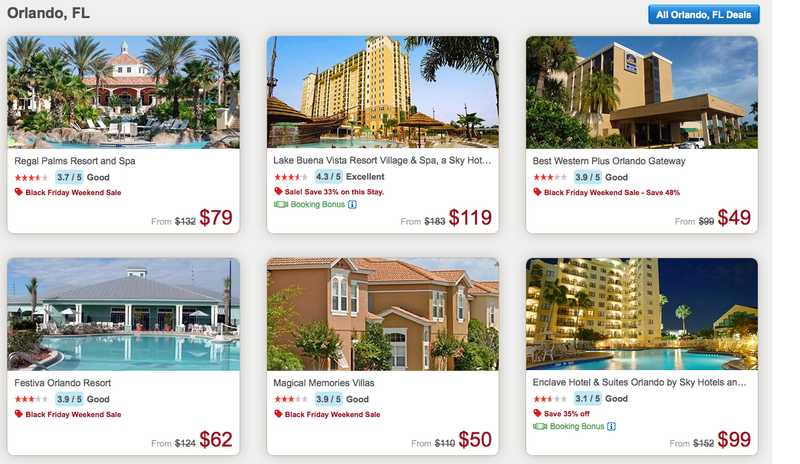 I did a little research on Orlando locations because there is so much to do- Legoland, Universal, Sea World etc and found several great deals including a hotel room in a location with 3.5 stars out of 5 for $54!! So affordable for the entire family that you can bring Grandma & Grandpa in their own room and spend quality time babysitter with the kids! Offer ends soon and is valid 4 day sale: From Black Friday to Cyber Monday, Save 50% with Black Friday Deals! Book by 11/26, Travel by 12/31 Offer states that you must *Book by November 26, 2012 for travel between November 23 – December 31, 2012. Sale on participating properties only. Minimum night stay may be required. Offers vary by property. Rooms and prices are subject to availability. Prices do not include taxes and fees and are subject to change without notice. Additional restrictions and blackout dates may apply. Again, offer states you must travel before end of year, BUT As you can see in the screen shot above, I booked mine for this summer!! you may need to double check the location and see if the offer is still carried over like mine was. Disclosure: As part of FTC Reg. all post containing an affiliate link must be properly disclosed. Check out my disclosure policy within my site as well for more information. wow these are great deals!